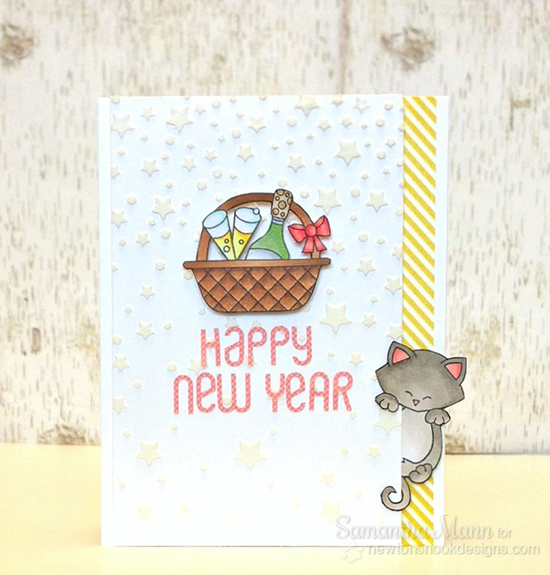 Newton's Nook Designs: Happy New Year card by Samantha Mann! Happy New Year Card with Kitty! Today I'm sharing this fun card by Samantha Mann just in time for the New Year! Are you ready for the new year yet? There's only a couple days left in 2014! Samantha used the image of the fun basket of champagne from the Basket of Wishes stamp set - which is just perfect for a New Years card! She also snuck in a cute kitty - from the Hanging Around stamp set, peeking off the card edge - ADORABLE! I also love the bright colors and star background! What a fun way to celebrate the new year! To read more details on how she made this card, make sure to visit Samantha's blog Sam's Scrap Candy.